Interesting - I have fun with the SSManager window too. Try checking on the 'applications' tab - is that also showing "scan to Evernote"? I was going to suggest you update your software but it appears you have the most recent version. It takes a bit longer, but I always let ScanSnap do the OCR for me. The PDF document remains OCR'd if I export it from Evernote. The PDF document loses its OCR if I export it from Evernote. The search results are consistent in Evernote, whether I view them from my desktop client or the Evernote web. The search results are not consistent because Evernote uses different OCR software depending on the platform. OCR works on notes that are stored in my local non-sync'd Evernote notebooks. Evernote cannot see my notes on my local non-sync'd notebooks, so the PDF's cannot be OCR'd. OCR's all my PDF's - no rules and I know it is done instantly. I saw this post (or an earlier version of it) before I started with ScanSnap and Evernote, so I'm also OCR'ing with SS. My question is to your point #4; what are these 5 magic rules? Looks like another rule has been added. A "scanned" page contains no more than 512 characters of regular, searchable text (e.g. this is enough for a text-based fax header or similar). PDF files that have already been processed by a separate OCR system will not satisfy this condition and will be rejected. 5.) If the analysis crashes or fails for some technical reason, typically due to a malformed PDF from some crazy source, or if the PDF is password protected (encrypted). 6.) If this analysis process takes more than 30 seconds to complete. Once the PDF has been deemed valid for processing, the PDF is run through our best-of-breed OCR engine which generates a searchable form of the same PDF. Not really sure what all the problems with the KB direct links are, but, that is the only form I have found that consistently works. And when I checked the links after posting, both links work now. DIIK. 1. 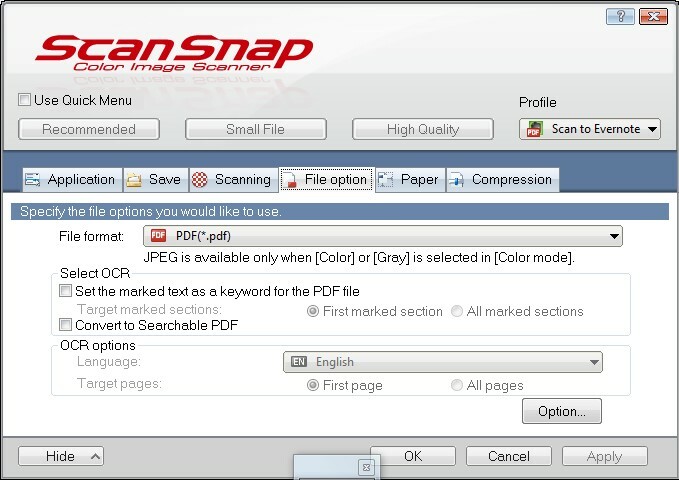 Locate the preferences files for ScanSnap. Most likely in ~/Library/Preferences. Name should be something like "jp.co.pfu.ScanSnap.V10L10.plist". 3. Open the file in a text editor, find the preference called "OCR" in the file and set the value (in the next line) to "0" instead of "1".